More on Carly can be found at her website. What he does leave out is something I don’t think alot of people are talking about, and that is that the U.S. Federal Reserve is exercising new approaches to affecting the economy. I think QE3 will be either be successful or at the very least, not unsuccessful. While being successful is important now, what is just as important is that in the future, the Fed (and other central banks around the world) will have a precedent for doing the same thing again. And that is a good thing. The head of the Fed, Ben Bernanke, should have done this along time ago. I think partly he did not because of push back and fears of what this might do. But now the precedent has been set, it will not be as hard to do again in the future. You can watch him on YouTube, but better still, go and buy some of his music. The areas are by and large rural and lower income. They also tend to be areas with fewer doctors, likely meaning less access to the health care resources available elsewhere in the country. I would be interested to know obesity rates and smoking rates in these areas. Also it is noteworthy that it is concentrated in the South of the U.S. I don’t know if there is a cultural element coming in there (and it would likely be hard to measure, especially compared to concrete things such as obesity, exercise rates, smoking, etc.). P.S. Obesity rates are here and they overlap to a great degree. via Andrew Sullivan’s blog. I wanted to know more, and I clicked through to this link, Flavorwire » Enrico Nagel’s Delightfully Strange Scanner Portraits. I recommend you do too: there’s lots of great portraiture there. 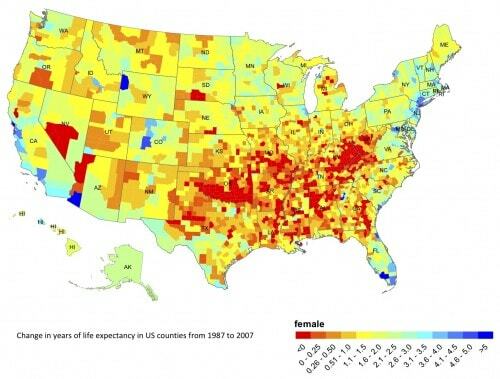 This is inexcusable: life expectancy rates are declining in the U.S. The five-year decline for white women rivals the catastrophic seven-year drop for Russian men in the years after the collapse of the Soviet Union, said Michael Marmot, director of the Institute of Health Equity in London. It’s not a small thing: it’s comparable to the collapse of the Soviet Union. American society as a whole is suffering badly. This is a key indicator of it, and a signifigant sign more dramatic changes need to occur.